One of the most common Body Language questions I get asked is, "What does crossing your arms on your chest really indicate? Well, here's a hint, the winning quarterback never stands this way. In this setting it is a clear sign of low confidence. 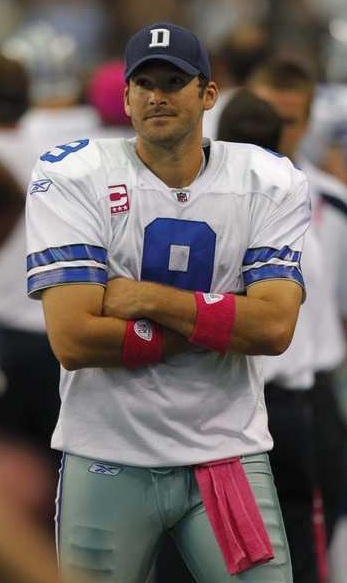 Tony Romo (above) and the Dallas Cowboys are in the final seconds of a loss to the Detroit Lions. It also can indicate a closed mind as well as defensiveness. Of course people also adopt this pose when they are cold - but this cause is easily sussed out. People rarely cross their arms in their own homes - the exception being when anticipating, participating or recalling an argument; or perhaps when they see something disagreeable on television. People will often say, "I'm more comfortable with my arms crossed" - but their emotional state is what engenders this comfort/discomfort. Thus it amazes me why so many CEO's, athletes, and celebrities are shown with their arms in this configuration when posing for magazine covers, etc. So, if you're in the legal profession, a negotiator or sales, you never want to try closing when the prospect has their arms crossed. You should figure out why they have a negative mindset and change their attitude - then it will be more comfortable for them to uncross their arms. A change in emotion causes the body & face to change appearances - but also remaining in these postures helps maintain these negative (or positive) emotional states. The body language is a strong component in emotional feedback loops.